Founded in the early 1970s, The National Institute for Automotive Service Excellence (ASE) is a non-profit organization whose purpose is to improve the quality of vehicle repair and automotive service to help protect automotive consumers as well as automotive professionals. By having a stringent certification process, auto technicians are able to offer proof to customers that they are knowledgeable experts in all areas of automotive repair. ASE certification is also a way for consumers to shop and compare the level of expertise among various auto mechanics. At USA Automotive, we pride ourselves on having some of the best and brightest ASE Certified Technicians in the Triangle. 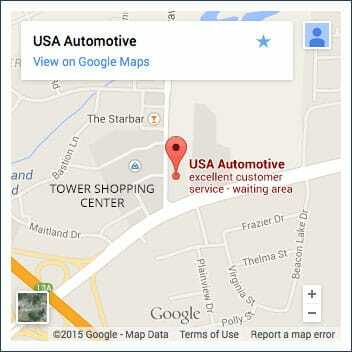 We are known for our outstanding customer service, attention to detail, and quality automotive repair. Our team of ASE certified mechanics provide you with the most advanced automotive repair services in Raleigh – every time! In order to qualify to be ASE certified, automotive professionals are required to have at least two years of on-the-job training or one year of on-the-job-training + a two-year degree in automotive repair. Additionally, qualified auto mechanics must pass an ASE Certification exam. To remain ASE certified, mechanics must re-take the ASE Certification exam every five years. At USA Automotive, all of our ASE technicians maintain their ASE Certifications. We also make sure that we stay up on the latest technology related to the automotive industry so that we can provide you with the best auto repair service in Raleigh, NC and surrounding areas. We know that you have many choices when it comes to auto repair, and we are committed to providing each of our customers with the best service possible. Stop in today, or call to schedule an appointment. As one of Raleigh’s leading auto repair shops, the USA Automotive team looks forward to being your number 1 choice for automotive repair in the Raleigh area!